Location: Lacave, in the Meurthe-et-Moselle departement of France (Lorraine Region). Notes: The castle of La Treyne is a castle located in Lacave, France.The existence of the castle of Treyne is attested in 1342. 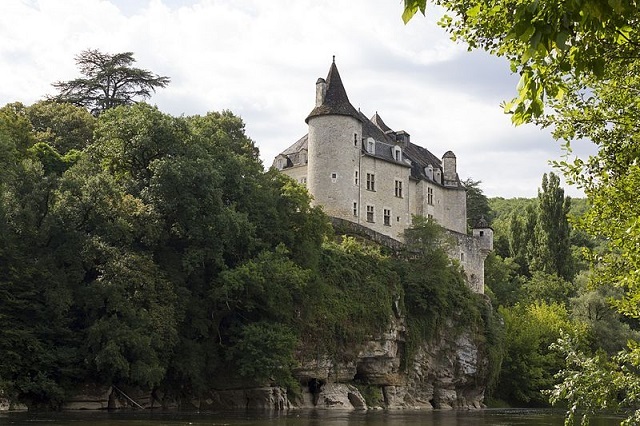 Its construction is probably due to Guillaume and Hughes de Rouffilhac whose family is native of Gourdon where it attested since the twelfth century. On 27 January 1356, on the bridge of Avignon, Noble Guillaume de Rouffilhac paid homage, bareheaded, on his knees and hands joined to "Magnificent man Messire Guillaume de Beaufort", Chevalier, Vicomte de Turenne, for the castle instead of The Treyne, on the edge of the Dordogne. Probably after the extinction of the Rouffilhac branch, the Viscount de Turenne entrusted the noble man Annet Hugon du Cluzel, on May 12, 1462, to the lordship of La Treyne, "with all high, medium and low justice." Cluzel built the church of Meyraguet in which he was buried. On May 7, 1519, Jean de la Treyne, son of Annet du Cluzel, married Jeanne de Coustin de Bourzolles. In 1540, Jean de la Treyne paid homage to the king for the castle, the woods, the rents, and full justice he owes to the Viscount de Turenne, Francis III of La Tour (1526-1557). In 1553, Louis de Cluzel is lord of the Treyne. He married Colette, known as Jeanne de Ricard de Genouillac (who died in 1607). Pierre de La Ramiere married by contract of December 11, 1553 with Gallienne de Cluzel, daughter of the late lord of the Treyne in Quercy, gentleman of the house of the King, and damsel Jeanne de Coustin. Pierre de la Ramiere received from his brother-in-law, Louis de Cluzel, the sum of 1,140 livres for his part in the maternal inheritance of his wife. He is nicknamed "Captain la Ramière". He converted to the Protestant religion. He was awarded the victory of the Protestant army of Coligny at La Roche-l'Abeille on 25 June 1569. This battle was the first in which Henri de Navarre took part in the presence of his mother, Jeanne d'Albret. Pierre de la Ramiere was killed in October 1569 at the siege of Saint-Jean-d'Angely. After the death of her husband, Gallienne de la Treyne was persecuted "because of the Protestant religion she and her husband had taken," and suffered much "by various" lawsuits and pillaging of her houses. " From this marriage were born seven children, six boys and one daughter, all in infancy. The elder, Gilles, was the universal heir with the exception of the noble house of Pécharnault, in Agenais, which was given to Jean, the second son. He married Jeanne du Vignal de Broval in the first marriage, and in second marriage with Suzanne du Cluzel de la Treyne, his first cousin.